Kura Sushi (or "Kula Sushi" in the US) is a chain of superb "revolving Sushi" restaurants. in addition to the sushi which revolves tantilizingly around the store, one can also order sushi to be delivered automatically to ones table via a computer and conveyor belt: a drone sushi shinkansen. At 100 yen for two pieces of sushi, and 150 yen for a bowl of soup, Kura Sushi is truly amazing value for money. The fish used in Kura Sushi tastes very fresh, perhaps due to the high turnover. Kura Sushi is very popular. 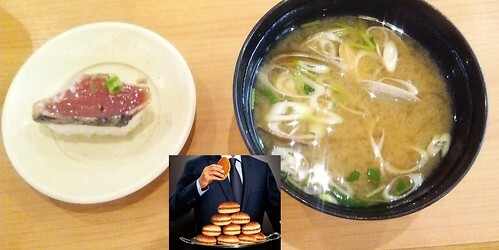 The above image shows bean curd (miso) soup with shellfish (asari) and seared bonito sushi. Map of Kura sushi branches is Japan. If you zoom into an area the Goole map should show the Kura sushi branches in that area. There are also 11 branches in the USA and four in Taiwan. The Japanese language list of Kura Sushi branches worldwide is here. The English language website of "Kula Sushi" branches in the USA is here. It is upsetting to me, however, how Kura Sushi are attempting to foist curry burgers on their clientelle, using the face of a traditional Japanese actor (inset bottom centre, face removed). Unhealthy curry burgers probably have a higher profit margin than deliscious, fresh, healthy Kura sushi. Please repent, Kura Sushi! Kura sushi is wonderful, but burgers will maim and kill the clients.